• The Department of Engineering has established design standards for small wireless facilities in the right-of-way. Click here to view. • The Department of Engineering seeks qualified candidates for the following positions: Facilities Engineer, Civil Engineer I. For consideration please send resume no later than May 17, 2019. Click here for more information. • The Department of Public Works has posted a Job Opening for a Heavy Equipment Mechanic. Click here for more information. 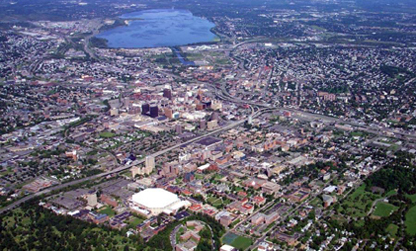 • The Greater Syracuse Property Development Corporation (GSPDC), a land bank jointly created by Syracuse and Onondaga County. The Greater Syracuse Land Bank’s meetings are open to the public. Regular meetings of the Board of Directors are held at 8:00 AM on the third Tuesday of each month at 431 East Fayette Street, Third Floor Conference Room. Committee meetings are held as needed and posted in advance. For more information, please visit the Land Bank's website or email info@syracuselandbank.org. • There are links for paying Judgments online. Click here for more information. • Parking tickets and water bills can be paid online by eCheck, credit card, or debit card. Click here. • Water bills can be paid also by telephone using a credit card at 1-800-394-3478. • Supplier Diversity – City of Syracuse Minority and Women-Owned Business Enterprise (MWBE) Participation Program. The Department of Neighborhood and Business Development administers the program committed to providing increased opportunities for City of Syracuse certified businesses. • Amanda’s Law requires essentially all residences, both new and existing, to have carbon monoxide alarms installed. Events are subject to change. Click on event for more details. Click here for a larger display and links to other area events calendars.